Sitting smug on the map of Indian tourist destinations, Kerala, the 'God's own country' is an internationally famed haven for tourists. Its breathtaking beaches, pal-fringed backwaters, mesmerizing hill stations, dense forests, cascading waterfalls, fascinating wildlife, arresting monuments and rich culture attracts tourists from across the globe. Plan a trip to Kerala for a complete 'revitalization'. Endowed with sheer natural beauty, Kerala is ideally located on the tropical Malabar Coast of South Western India. UNICEF and WHO conferred the title of the 'World's first baby friendly state' on Kerala. Kerala has a lot to offer in terms of tourist attractions. Some of the famous tourist attractions in Kerala include the hill stations of Munnar, Wayanad, Ponmudi and Nelliampati; the beaches at Cherai, Poovar and Kovalam; wildlife at Periyar and Eravikulam National park and backwaters at Kumarakon, Punnamada and Alleppey. All these destinations offer a wide range of resorts for a comfortable and hospitable accommodation to tourists. Kerala is a home to the finest Heritage and Ayurvedic Resorts such as Emerald Isle Heritage Villa, Tharavad Heritage Resort, Alleppy Backwater Resort, Lake Palace Hotel and Coir village Resort in Alleppy. They are specialized in offering rejuvenating Ayurvedic treatments and massages. 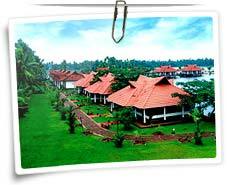 The Kerala resorts offer great hospitality and ambiance. There are many wonderful resorts in Kerala to suit all types of budgets. Kovalam is another famous destination of Kerala where hotels ranging from Five-Star Hotels to Three Star and Budget Hotels, are available. Some of the famous hotels are Hotel Leela Kovalam Beach Resort, Hotel Surya Samudra, Manaltheeram Beach, Taj Green Cove and Harmonia Beach Resort. Munnar in Kerala is known for its lush green hills, romantic lakes, dense forests, tea, coffee and spice gardens. Plan a stay at the wonderful resorts of Munnar to have a great experience. The well known resorts in Munnar are the Club Mahendra Lakeview Resort, Edsaaery Easterned, Tea Country, Siena Village, Windermere Estate, Fort Hotel Munnar Estate, Tall Tree Resort Estate and Hotel Blackberry Hills Estate. Kerala is dotted with amazing resorts, which offer state-of-the-art facilities and services making your stay memorable.